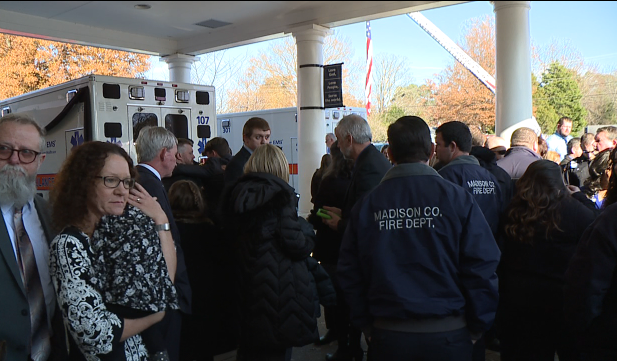 JACKSON, Tenn. — Family, friends and first responders honored Zachary Pruitt on Wednesday for his service as a paramedic and to his country during a funeral and graveside ceremony. A father, son and veteran were just a few roles being remembered for Pruitt, a paramedic and firefighter, as his loved ones gathered Wednesday afternoon. Services were held at Englewood Baptist Church in Jackson where ambulances from different counties along with other first responders turned out to honor Pruitt’s life. Pruitt was carried from Englewood Baptist Church where the funeral was held to the cemetery by ambulance. The sides of the ambulance were covered in black along with black bows on the front of other ambulances to honor him. As the procession made its way to the cemetery, law enforcement officers blocked parts of North Highland Avenue. The graveside service was held at Highland Memorial Gardens in north Jackson. The service ended with a final radio call for Pruitt where emotions ran high for many fellow responders. Pruitt is survived by his wife and two children.